After I get a handle on high speed photography for shooting things that are fast I'm going to see if I can learn how to take a lot of pictures of things that are slow. This is a very nice video shot in Spain. What's going on at the horizon in the Milky Way section is a sand storm in the Sahara plus lights from the canary islands. I like listening to these three languages. The Russian is very alien to me. There are no sounds in it that make me think of a word. It's like listening to music. The Italian is more like listening to ham radio with a lot of static where you hear a word from time to time. Just an FYI: First mammals to achieve orbit, in order: Dog, Guinea Pig, Mouse, Russian Human, Chimpanzee, American Human. I hope other countries pick up our slack and get some good science experiments on the space station. Meanwhile the big news today is where will the shuttles go. (Live Streaming, noon EST) Kennedy Space Center seems to be a forerunner. If they get one I hope they reorganize the management of their tourism. I refer you to my Negative Critique from last year and my rant about the creepy Snoopy with his head shoved in a bubble. 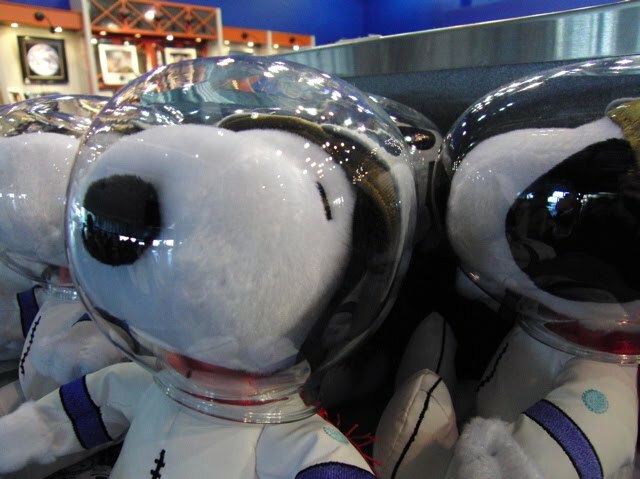 My friend who works on the space suits tells me that Snoopy is a big deal to the Apollo mission, and I acknowledge the meaning, but it still just really weirds me out. *UPDATE: Atlantis is going to live at Kennedy Space Center. Discovery goes to Smithsonian, which we knew already. Surprise is Endeavor going to the California Science Center in Los Angeles near the Palmdale facility that built it. That's nice. The prototype, Entrepid, goes to the Intrepid Sea, Air & Space Museum in New York City. That's a good geographic spread. I'm sure Seattle is crushed and Johnson Space Center is probably pretty disappointed. Sorry you guys. This whole thing is pretty sad. Charlie Bolden, NASA director, almost cried about 10 times reading his speech. He said we should stay focused on the next few missions. That's the engineer way. Solve the problems, make it work, and deal with the demise of our own career later. It's tough when you define yourself with a career then you make it disappear. I really enjoyed this lovely blog post from Ron Garan, the NASA astronaut who rode up to orbit with two cosmonauts this week. He tells me a lot I wanted to know about how the Soyuz compares to the shuttle. Smoother at first, which I noticed in the onboard video during launch. I've been on the shuttle simulator at Kennedy Space Center. The shuttle is not smooth. Lying in our seats before launch was actually very peaceful. We periodically felt vibrations and valves opening and closing, and we heard fans and motors turning on and off, but through all that I felt a peaceful reassurance that everything was ready to go. The vehicle definitely felt alive and ready. Laying there strapped to the rocket I thought about all those people that are close to me that were watching there in Baikonur, on TV or online. What do you think, Mama, are we going to count off 10 points for "laying there" or call it poetic license? I say if Bob Dylan is completely forgiven then Ron Garan is too. For anybody confused about the proper usage of lie and lay, here's a primer courtesy of my mama. Lay is something you do to something. Lie is something you do. It gets complicated because of the past tense. When I get in my bed, I lie down. In a few minutes, I will lie down. As I'm nestling right this minute, I lay my head on the pillow. Yesterday when I went to bed, I lay down. Last night when I went to bed, I laid my head on the pillow. Sexually, it's doing something to her. He lays her today, he laid her yesterday. If he does it with her and not to her the above rules apply: He "lay" with her yesterday, and lies with her today. The most notorious error (completely forgiven) is Lay Lady Lay, Lay Across My Big Brass Bed. Rise and raise are the same complication. You can see last Monday's Soyuz launch in high def on the NASA video gallery but it's not embeddable, sorry. There's an interview on Mad Art Lab with Minchin and the makers of the movie. I made a word cloud of the three Spasms of Accommodations posts that have been read the most. Sonic Boom Meets Sun Dog, Why I Hate Tattoos, and Smart Blind.